Sun Ten is a leading manufacturer of Chinese herbal extract products. We manufacture the famous Sun Ten brand of Chinese herbal formula products and single herbal medicinal. As a manufacturer, we also function as a full service OEM/ODM contact manufacturer specializing in Chinese herbal extract products. Because of our experience, resources and scientific infrastructure, Sun Ten is contracted to manufacture according to detailed specifications necessary for scientific studies. Our manufacturing process and equipment are designed to minimize the inherent problems in the extraction and concentration of herbs while maximizing product efficiency, yield, and quality. Combining our manufacturing expertise with modern equipment and strict quality control, we are able to produce the best concentrated herbal extracts in the market. We are also fully experienced in taking on contract manufacturing fully customized to meet your unique needs and special demands. All of Sun Ten’s source herbal materials are obtained from private growers and suppliers that meet the specifications established by Sun Ten. Sun Ten secures the resources by maintaining long term relationships with the supplying parties and routinely purchasing crops that pass criteria specifications. Purchasing materials directly from the public market can result in problematic source materials with issues such as non-authentic herbal medicinals, herbal medicinals that are not safe due to contamination, toxicity or lacing, and those with inferior constituent ratios. Sun Ten does not accept using any source materials that do not meet the quality standards. The issue of medicinal authentication is not only a pressing issue but it demands close attention. Simply stated, an herbal medicinal that is not authenticated may not be the correct or desired medicinal. Due to many reasons there may be a large variety of herbal materials being used and sold on the market that are not what we are claimed to be. Sun Ten has established that the herbal medicinal must be of the correct species before we may be implemented into the manufacture process. Verification of authenticity is determined through analytical scientific methods prior to acquisition of the source materials. Sun Ten used the Taiwan People’s Republic of China Pharmacopeia and other world recognized pharmacopeias as the standard reference of correct species. Sun Ten is dedicated to consistent authenticity, efficacy, safety and quality of source herbal medicinal used. In order to accomplish and maintain this important aspect of the operation, we have developed the Sun Ten herbal sourcing team. It is the team’s mission to oversee and maintain all aspects of herbal source materials from authentication and quality assessment to the handling, storage and condition of materials that have acquired for manufacturing. Our manufacturing processes and equipment are developed to retain the active constituents to optimize the products efficiency. The processes have been validated and each production batch is carefully documented. Historically the majority of classical Chinese herbal formulas have been decocted with water. It offers excellent medicinal constituent extraction as a neutral solvent that does not alter the desired medicinal actions of the herbs. The water based decoction process draws out the desired medicinal constituents and optimizes the formulas unique character. Decocting all the ingredients of a formula together in water yields a final product that is synergistic refined and more potent that the sum of the ingredients if taken individually. Sun Ten uses only water based decoction methods for the entire manufacturing process. The sequence of the herbs within a decoction determines the efficacy of the formulas. For example, the rhubarb (da huang) in Rhubarb & Mirabilitum Combination (tiao wei cheng qi tang) must be decocted first, followed by the other ingredients to enable the formula to offer the therapeutic effect “harmonize the stomach and soothe the qi”. Comprehensive chemistries will change upon the sequence of herbal decoction. Sun Ten follows established sequence of decoction appropriate to each formulation because the desired efficacy of the final product depends on it. According to traditional Chinese herbal preparation methodologies, the handling of certain herbal medicinals is paramount to ensure efficacy. When preparing aromatic herbal medicinals by decoction, it is known that we must add the essential oil recovery procedure during the last few minutes of the decoction process. This is because prolonged exposure to the intense heat will damage and evaporate the essential oils that contain essential active constituents needed to deliver the desired medicinal effect. When manufacturing at a large scale using pharmaceutical grade closed decoction procedures, handling herbal medicinals that contain sensitive essential oil necessitates an alternate, scientific procedure to retain essential oil. An estimated 23%-29% of the active volatile components are typically loss during the manufacture process. It was discovered by analyzing the constituents contained within recollected distillate that a majority of active constituents were lost. To prevent the loss of thermal sensitive constituents, a proprietary essential oil recovery device has been developed to retain the active ingredients and maximize the efficacy of the finished product. The essential oil based active constituents retained are verified by analytical verification. Low temperature vacuum concentration can prevent substantial loss of thermal sensitive constituents. 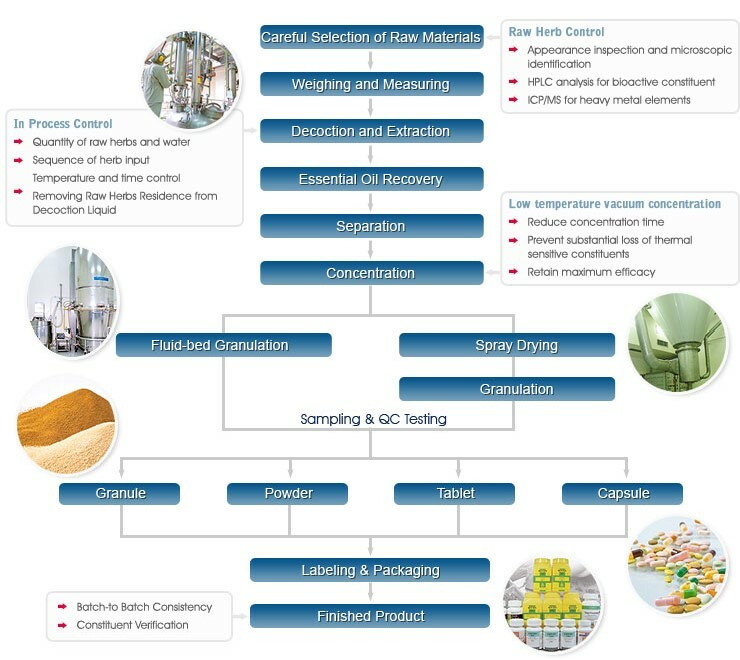 Fluid- bed granulation, the final step of processing by transforming concentrated liquid to granules, is conducted with the addition of an excipient to stabilize the finished product. The use of excipients in Chinese herbal extracts is necessary to transform concentrated herbal extract liquid into the dry granule. The amount of excipients used in each product varies depending on the characteristics of the herbs within the formulation. Without the correct amount of excipient, the granules, once exposed to air, will absorb atmospheric moisture, clump together and become unstable. Sun Ten uses non-GMO free cornstarch as an excipient. The features of spray drying are using less excipients and effectively retaining active constitutes. The spray drying products also proven to have better solubility, in other words, it can have better absorption for human body.